Tomes and Tequila: Bookish Goodies Vol. 8 The Game of Thrones Edition! 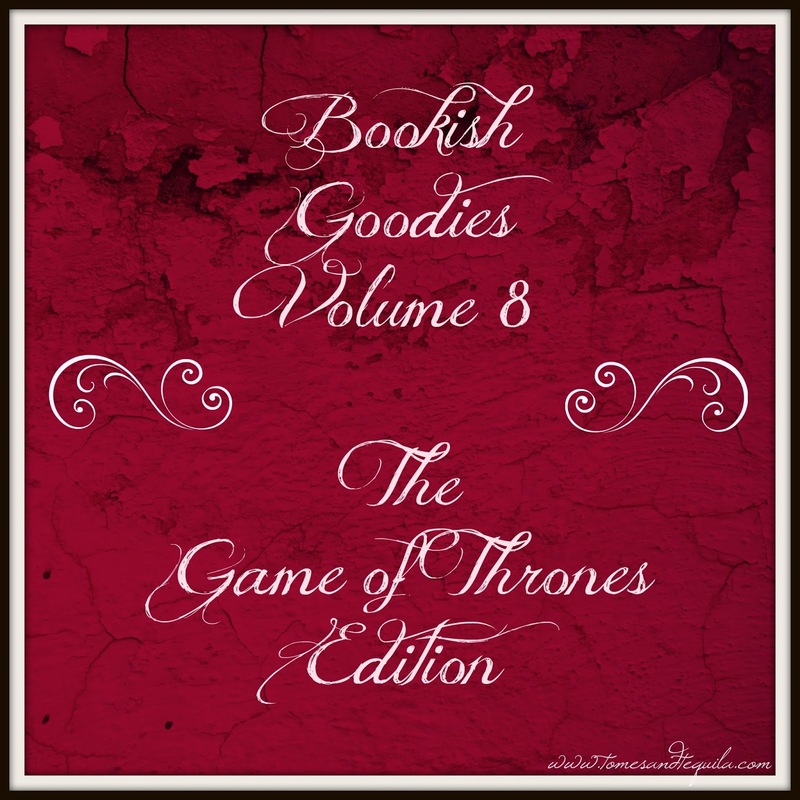 Bookish Goodies Vol. 8 The Game of Thrones Edition! First off, I feel I need to start with a giant It's National Library Week!!! My big plan is to have content on the blog EVERY DAY to honor this most fabulous of all weeks. It would be great if all of my readers popped into their local Library this week, if for no reason other than to support the cause. And now on to my latest Bookish Goodies Guide, this one devoted to all things Game of Thrones! I first have to admit that I have only read 1 1/2 of the books. 😛 This is that spot in the blog post where you're allowed to be disappointed in me. But I am a HUGE fan of the show, and my children have read the books (please remember that they are both actually adults). Just like with my Harry Potter list, my biggest issue is paring it down to only 10 items...but I'm going to try my best. 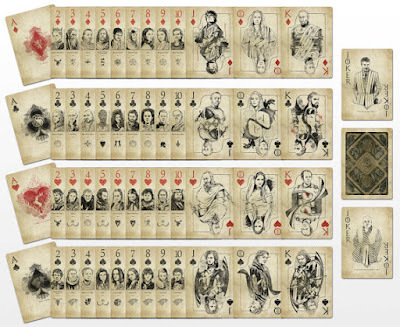 I absolutely adore themed playing cards, and this Game of Thrones deck does not disappoint. I think the aging suits the design perfectly and it would be fun to play cards with this deck! You can find it on TimeVoid for $25.00. 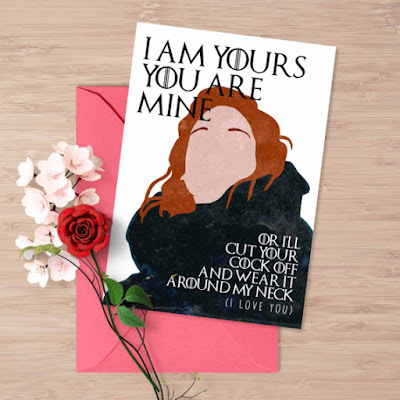 I found numerous items on Etsy that had Khaleesi and Khal Drogo's sentimental lovey-dovey sayings on it, but my favorite was this coffee mug set. Thank heavens they didn't call each other pookie or snuggle buns...or something ridiculous like that, it would make for a lot more nauseating marketing. 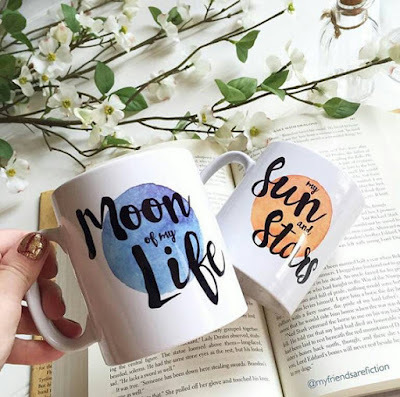 But this would be a good set for the Moon of Your Life...or Your Sun and Stars, for $19.38 by Dreamscapeink. My son claims it's too early for this one, but I think it's amazing. I also found a door wedge that said this...and it was a close second...but I went for the door mat. 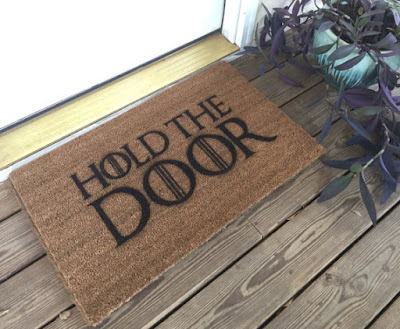 My door mats usually last about 1 season up here in the frozen tundra, so why not have one that makes your guests start crying as they walk in the house...at least for a few months?? You can buy this from SouthbySouthHome for $34.99. I can never find a bottle opener when I need one, and neither can my husband. I even bought him those flip flops with the bottle opener in the bottom, and we both forget it's there. 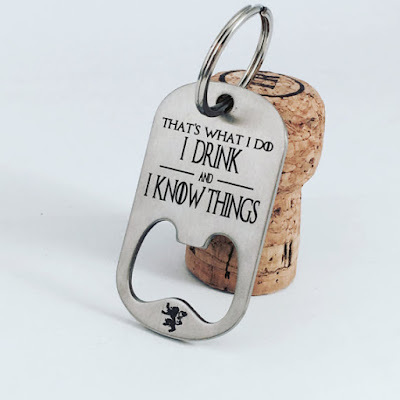 It can't hurt to have another bottle opener on his keychain...this one is PERFECT for him! Because just like Tyrion, he drinks...and he knows things. You can find this one at LoraDouglasJewelry for $17.50+. 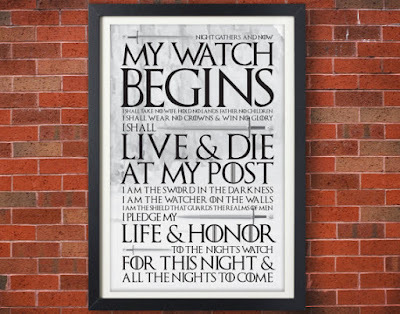 My daughter can't hear this without crying hysterically...therefore we've already bought her a t-shirt with the Night's Watch Oath on it. I'm thinking she now needs this incredibly cool typographic poster for her room. We are cruel people sometimes. You too can inflict emotional pain on your family members for $13 at EAlexDesigns. 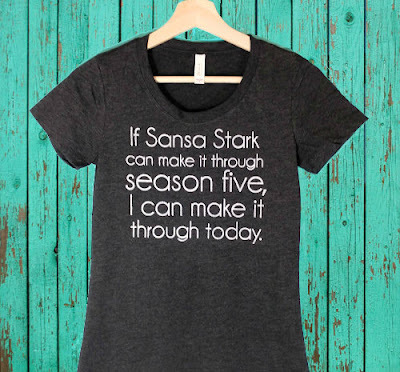 Okay, every woman wants a Khaleesi shirt...or a mother of dragons shirt...or some other shirt that makes them feel like her royal badass. 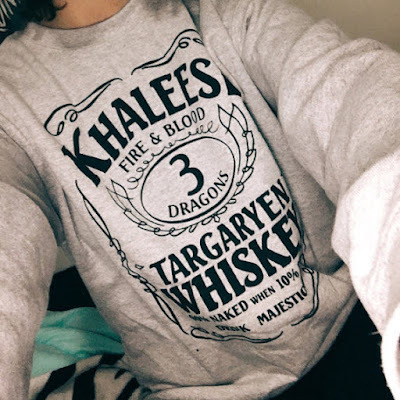 I think this take...the Targaryen Whiskey sweatshirt...is pretty cool. Plus it looks warm. You can find it at the parenholly shop for $26.99+. I have just found the next Anniversary or Birthday card for your significant other. You can thank me for this later. I don't have much else to say other than I love this so so much. You can find it at JessicaScissorhands for $3.84+. 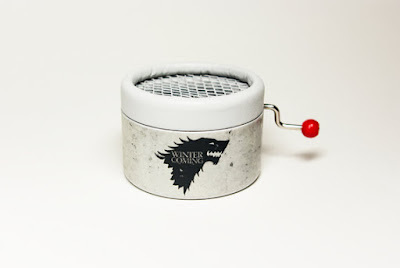 I think this music box that plays the theme song from Game of Thrones is incredibly unique, and great for a collector or super fan of the show...or music boxes in general. You can buy it in white or black from CajasMusicales for $15.91. 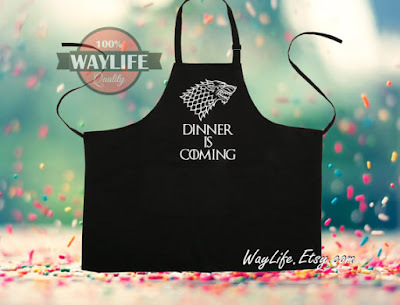 This is a lovely large, heavy duty apron with 3 pockets to wear while showing off your love for Game of Thrones. Insert cool and witty joke about Dinner Coming right here because I'm having a hard time coming up with one but I really thought the design of it was snazzy. This one can be found at WayLife for $29.49+. I am really and truly in love with this shirt. I think I'm going to write this saying down as part of my daily affirmations...because it's true. And considering what George R.R. Martin has done to most of his other characters, it's truly amazing that Sansa is still around. You can buy this beautiful t-shirt at Nerdabel for $25. And because my snark is especially strong today, and my descriptions are exceedingly short, I am going to throw in an 11th item for good measure. 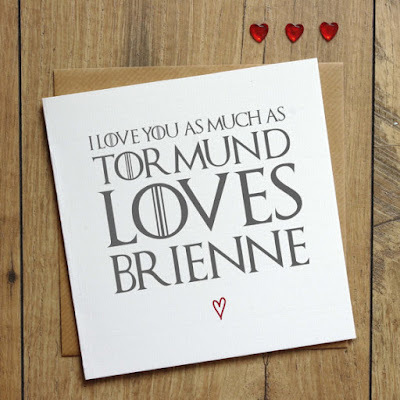 So there be just a few of the amazing Game of Thrones themed items I have found perusing the interwebs. I hope you like them as much as I do...or you at least laughed a few times while scrolling down the page. 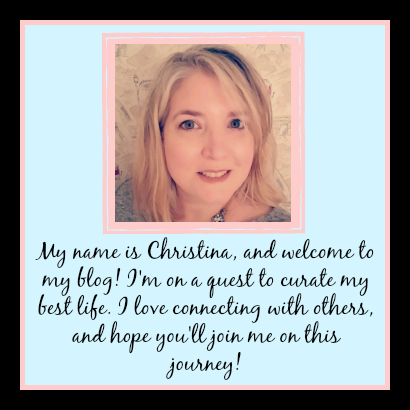 Let me know either in the comments here or over on my Facebook page if you have a theme or fandom you'd like me to make a Bookish Goodies guide for! Only about 3 1/2 more months until the show comes back on again! !